Home » Blog » Humor » Is This the Pot of Gold at the End of the Rainbow? Is This the Pot of Gold at the End of the Rainbow? June 6, 2016 By Michael M. Wechsler, Esq. 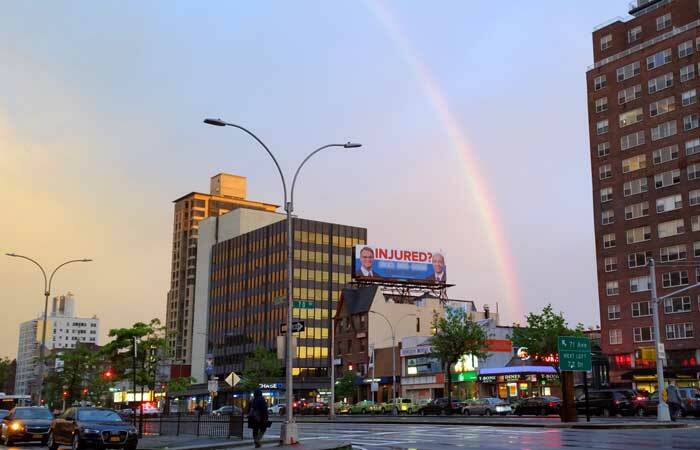 Is this what they meant by “pot of gold at the end of the rainbow?” I don’t think the law firm planned it that way but, especially as an attorney, I still found this gorgeous view of Queens Boulevard hilarious. While others might consider the scene marred by the billboard, I’ll still share with you my photo of yesterday’s rainbow in New York City. The origin of this phrase is Ireland. The Irish were said to be fond of saying that one would be as likely to find a pot of gold as they would the end of a rainbow. This phrase came about from an Irish wish where a very poor man and wife stumble upon a leprechaun who agrees to grant them one wish. After bickering between themselves and only able to come up with two wishes, the wise and mischievous leprechaun chided both of them for their selfishness. He informs the couple that while he will not grant them any wish, he will still be kind enough to leave a pot of gold which the couple can find at the end of the rainbow. Several law firms have used the symbol of the leprechaun for their firm logo. While I have yet to see one that connects the rainbow to the pot of gold, virtually all of them proudly publish their monetary awards and settlements for personal injury claims.